And I had my hair done specially for the radio………. It was all very exciting this week as we had chance to let a wider audience know what we do at Space2Create when a journalist from Radio Cumbria called in. It all gets a bit nervy when a microphone appear in front of you but the comforting thought is that all the really inane comments can be edited out (I hope). The rest of the volunteers and service users talked far more sense than me and made us sound good! It’s all about raising profile and letting people know how what we do helps some very ill and vulnerable individuals. It’s growing all the time. Last week we engaged with 83 people in our unit. That’s 83 people from the local area who have benefited in some way by coming to us, feeling more positive, feeling stronger and more confident, learning new skills, getting out of the house. The highlight for me though was a bit of a difficult issue to start with. Late one evening I started getting some very down and negative text messages from a service user. They wanted to stay at home, not see anyone and were feeling so low they wanted to cut everyone off. Managed to persuade them to just come along to a session and to not be alone and isolated. We arranged that a neighbour would bring them in. They came and did some stunning artwork and as they left were smiling and saying how much they realised they needed people round them. It was hard for them going back to an empty house but they know that they can get out to us and be with others. February looks set to be a busy month of events so keep an eye out for all that’s coming. Karen and Flo came for their second visit with the amazing selection of items from Sprint Mill. Those who missed last week created pictures from the objects with Flo and the others were doing some creative writing with Karen based on their pictures. A busy DeafArt group today. The group were creating pictures using torn paper collage. A really good session which started with Jenny coming to invite the group to take part in a project to fill Wainwright Yard in Kendal with textiles based on buildings. The group were very enthusiastic and will be contributing. Then Kirsty had the group making very cute little mini hats from wool. Chris also made a collage on canvas on our building theme using material and old children’s blocks. A fun session creating abstract paper sculpture not using any glue or tape to hold together. We cut strips of card then shaped them. We created random designs holding strips of card using joins made by slitting two pieces and linking them together. Why do we bother with exhibitions!? This is a question I often ask. Usually after working for days to select, prepare, mount and frame artwork then hang it in the gallery space, do the labels, advertise and sit curating it for long hours with a few people wandering through.Why does Space2Create put so much effort into exhibitions? Most artwork is for sale so you can also support the artist and charity by buying art. Selling work pushes the positive impact just a little higher and also raises much needed funds for Space2Create. Next time you see an exhibition advertised why not give half an hour of your time to come and take a look. That half hour can have a massive impact on somebodies wellbeing. An interesting morning g of art and dehumidifiers! The dehumidifiers were put in place to tackle the damp outside wall after the floods. Bit noisy! We worked in the back room. We looked at pictures of buildings and selected sections or bits from more than one. We combined these drawing in pen then added some colour using brusho inks. We also prepared some plaster of Paris in supermarket plastic trays ready for next week to make 3D buildings. We had a very creative session today. After our usual warm up writing Maggie had us thinking about stories relating to the Yards in Kendal with a view to writing a short play. We discussed a few ideas and Maggie asked us a series of questions to get us going. There were some fabulous ideas from the group. Only rough at the moment. After a some of us developed these ideas while others were turning their ideas into poems which sat alongside the stories. The group used plaster casts from plastic supermarket trays to use as a base to create building. Using a mix of paint, textiles and other bits they created the buildings. One person was busy making a pair of drum stick for a band they are in. The group carried on the buildings theme using the technique of dragging acrylic paint with card squares. They then added additional detail. A busy session. A very creative session today as the group welcomed Flo and Karen from Sprint Mill. They brought some of the amazing collection of objects from the Mill and the group was selecting and arranging these. As they were not fixed, photos were taken to record the images. The group found the session very relaxing and therapeutic so ate looking forward to the second visit next week. We started properly this week despite the damp and mouldy outside wall! And what a busy week it has been. All our groups were busy this week. It always works like that we find. As you approach Christmas numbers dwindle then in the New Year, wallop! loads turn up. We are very pleased that so many people feel strong enough and that we offer a safe place for the vulnerable and lonely people of Kendal (and beyond) to come and feel welcome and wanted. Look out for information about opening times for our exhibition “The Outsiders” which was supposed to open the weekend of the floods! We are opening next weekend on Saturday 23rd January and 6th February 11-4 for people to come along and see some fantastic artwork, Please come along and support us, just by coming to see the artwork you play a major role in what we do which is inspiring, motivating and building confidence in our members. You might even fancy buying some art or simply make a donation. It all helps! Another consequence of the flood is that we have been able to help different groups working with vulnerable adults who had their premises flooded. We have groups from the Deaf Centre, DeafArt on Thursday mornings and also the Deaf Club on Friday nights with us in the unit. We are very pleased to be able to help these brilliant groups continue their great work supporting others. We are also talking to Cumbria Care about them moving a group to us after the Whinfell Centre was flooded on Shap Road. 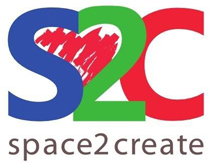 And finally we were very grateful to the Green Door Artists who this week announced that Space2Create would be the Charity to benefit from their annual art auction. We will post more details about that soon. We have been very grateful to the Green Door artists over the last year, letting us be part of the Green Door Art trail and with so many of their artists being involved in the Transformations Project with us. Gosh what a lot of stuff! And I didn’t even moan about funding! This was a really fun session. After our Christmas break we were all glad to be creating again. A combination of being inspired by the Abbot Hall Canelleto exhibition and the work of Peter Blake. Se cut up photos of the town hall selecting bits then glued them down in a new arrangement then drew additional parts to create new buildings and added colour. Really wacky results. Good session. Good session with Maggie. After the normal warm up exercises we looked at developing characters for the short plays the group is writing. Maggie brought a rucksack full of assorted items and asked us to create a story about the potential owner from the clues. This developed some diverse and interesting characters. To finish we were given random words and constructed nonsense poems. We had a very colourful and decorative session today, where we cut a variety of coloured paper and card up into squares, and a circular quarter section was drawn on to fifteen tiles and circulated around the table. The group set to work, painting, collaging and drawing patterns and colours onto the tiles, with pencils and marker pens. Some tiles were coloured, then handed to another participant, to add further detail or colour. In the end, we assembled the tiles and moved them around, untill all the tiles seemed to work well together. The Thursday Group took on the buildings theme using collage to create new pictures. They used a wide range of materials including magazine pics, wallpaper samples, textiles and buttons. One member was preparing a design for a lino cut. An really enjoyable session. The DeafArt group was very busy today and they carried with rearranging the Town Hall. Lots took there’s away before photos were taken! After S2C delayed starting until the 12th of January because of the Unit’s outside walls being damp we are all ready to get going properly. We do have to say the landlord will be doing work on the walls so we may have to cancel odd sessions so keep your eye on the website or social media for updates. Even though the main groups were not on this week other things happened. The Comic Art festival Team were in the unit for a meeting. We also had the DeafArt group on Thursday along with a management meeting for the Deaf Club in the evening. On Friday afternoon the Dementia Group were in then on Friday night the Deaf Club had their first session in our unit. We are helping them out after the Deaf Centre was flooded. Until that is sorted they will be using Unit 31. Look out for next weeks timetable on the home page which will be up from Sunday. Looking ahead it’s another busy year of projects and exhibitions. Our Creative Writing group on Wednesday mornings will be writing short plays for the Community Theatre Project running in the Summer performing short plays in the Yards of Kendal. We still have not officially opened our current exhibition “The Outcasts” which we will hopefully do in the next couple of weeks. It will be a short run though as an exiting project and exhibition by Tim Leeson, Tony Birchwood and Helen Issac is exhibiting then with the preview on 26th February. They have been looking at local landmark Scouts Scar and are producing a wide range of artwork showing different aspects of a very beautiful local spot. We also hope to have Kevin Hankey exhibit his range of print artworks in the first few months of the year. Artist Karen Lloyd and Sprint Mill are working with our WellArt group in January looking to use the vast collection of objects from there to produce artwork and photograph it. We will also be continuing our links with Lakeland Arts to work on projects and visit the exhibitions at Abbot Hall and Blackwell. We hope to revamp the website content a little too so it gives a clear idea of what we offer and how we can help. Please do get in touch. About coming to sessions, about exhibition (seeing them or having one! ), about volunteering or just to see what we do.